The competition in electric class 8 trucks is quickly heating up in response to Tesla’s Semi reveal last year. 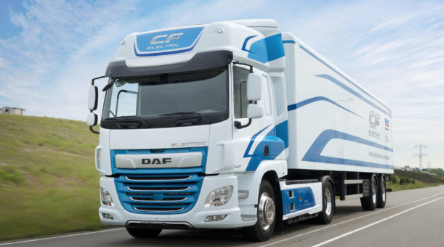 This time, DAF Trucks has revealed its new CF Electric class 8 truck that it developed in partnership with VDL Groep. The Eco-friendly truck boasts a 100 kilometer range with fast charging, and has a quick charge feature in just 30 minutes in order to recharge while being loaded or unloaded. A full charge of its 170kWh battery pack takes a bit longer at 1.5 hours, which is still extremely rapid, considering how massive the battery is. The first round of CF Electric trucks will be delivered to key customers this year in a 4×2 tractor configuration developed for up to 40 ton distribution applications within urban areas in which single or double axle semi-trailers are the standard. VDL has proven itself as not just a builder of large electric vehicles through its years of experience with buses but also as a robust partner for DAF as it dives into fully electric powertrains for its trucks.